us Jn^o Walley John Wilson. Suffolk Ss Roxbury 28th Nov^r 1734. "Massachusetts, Land Records, 1620-1986," digital images, Church of Jesus Christ of Latter-Day Saints, FamilySearch (https://familysearch.org : accessed 4 June 2017); Suffolk County, "Deeds, 1733-1734, Vol. 48-49," Volume 49, page 236 (image 591 of 613), Sale of Roxbury land by Patrick Greggory to Shubael Seaver's heirs, written 28 November 1734, recorded 12 March 1734/5. I posted the Indenture that defined all of the real property and Shubael Seaver's desires for his five children should have a share in Amanuensis Monday - Deed Records for Shubael Seaver (1640-1730) in Roxbury, Massachusetts - Part 1. 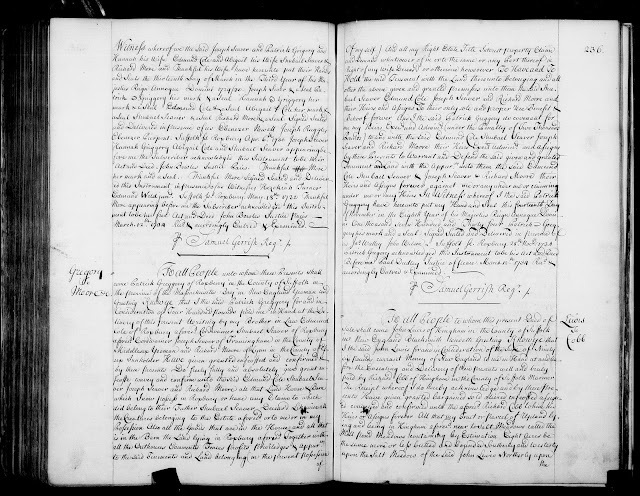 In Amanuensis Monday - Deed Records for Shubael Seaver (1640-1730) in Roxbury, Massachusetts - Part 2 thefive heirs at-law agreed to a division of the real property of their father, Shubael Seaver. In this deed, one of the heirs, Patrick Greggory (his wife Hannah, a daughter of Shubael Seaver, is apparently deceased in 1734) sells his portion of the real property to the other four heirs for 400 pounds. According to the property division agreement, Joseph Seaver received one half of the Shubael Seaver homestead and Patrick Gregory received the other half. In this deed, the four heirs each receive one-fourth of the Gregory property. By this time (1730-1735), Joseph Seaver has moved his household to Framingham yet he still owns at least half of his father's property in Roxbury. Joseph Seaver (1672-1754) and his wife Mary (read) Bruce are my 7th great-grandparents, through their son Robert Seaver (1702-1752) who married Eunice Rayment in 1726.